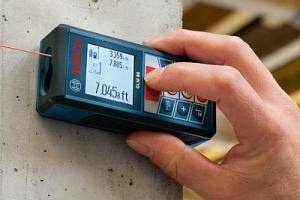 The Bosch GLM 80 Professional Laser Rangefinder is the successor of the DLE 70. It belongs to the product line “blue” or “Professional”, so it is an instrument that is built for craftsmen and professionals. This laser rangefinder comes with some new features that sets it apart from almost all other laser distance measurers. The operation is easy to learn at least for the standard functions you don’t need the manual. The large display is easy to read. It is very clever that the display rotates so that it is easier to read. Depending on the location of the device, the display switches to “portrait” or “landscape”. Shutdown, which focuses the laser after 20 seconds and the odometer 300 seconds. So the battery life is increased. One battery charge lasts for up to 25,000 measurements. Measures distances up to 265 ft. with up to 1/16″ accuracy. The typical measuring tolerance is 1.5 mm. The measurement time is less than 0.5 seconds and the maximum measurement time is 4 seconds. GLM 80, it also depends on the accuracy of the tilt measurement. The inclination can be measured over 360 degrees with a tolerance of +/- 0.2 degrees. The GLM 80 holds the ISO 16331-1 standard, which demands a high standard of accuracy. The LDM Bosch GLM 80 Professional is handy and small. Thanks to IP 54 it withstands dust and splash water. Thanks to gumming the LDM feels great if hold in the hand. 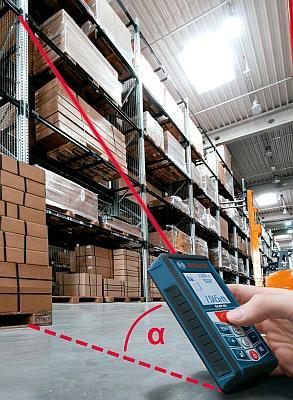 Measurements from corners and hard-to-reach areas are no problem with the folding metal measurement pin. The housing has a 1/4 “thread for tripods. The price is very fair, because high accuracy and the rare tilt sensor for inclination measurements. Theses make a significant difference to other laser rangefinders. The possibilities and the comfort by the battery are much larger GLM 80. Bosch’s GLM 80 offers a lot for your money. The list price is USD 249. But online this laser rangefinder can be bought online much cheaper. The Bosch GLM 80 offers an integrated inclinometer and a lithium-ion battery which is much more than the entry-level devices do. The GLM 80 was successful in our test. The measuring range up to 80 meters makes it suitable for large interior rooms. The price is really reasonable, when one considers the additional functions. Buyers share their experiences in positive Amazon reviews for the Bosch GLM 80. The measuring rail R 60 for the GLM 80 Professional Laser Rangefinder is a really useful addition: Measuring the inclination or the angle but is facilitated and due to the length of a more precise result. as an add-on for the LDM. Whoever used the GLM 80 laser rangefinder together with the 24-inch R 60 measuring rail is convinced of this combination. This two can be bought together as a combo for a bundle price.